From cold brew cocktails to French press punches, these cocktail recipes are perfect whether you're entertaining at home or bringing something to a party. Whether your idea of brunch involves pancakes in your PJs or an elaborate spread for the extended family, cocktails are part of the experience. Brunch cocktails have evolved beyond the classic Mimosa. This leisurely meal is often about catching up with friends and family over eggs Benedict and other rich dishes. Thus, the best drink pairings are low in alcohol. Especially for home entertaining, it’s all about pitchers that include colorful fresh fruit (and sometimes veggies). Cocktails with effervescent, bright flavors gently wake your palate and won’t tank your day. Light, fresh drinks are “perfect for lazy Sundays amongst friends,” says Kevin Delk, owner of Beatrice & Woodsley, a Denver restaurant that frequently lands on top brunch lists with its “cabin in the woods” vibe. The ideal daytime drink, he says, is playful and well balanced. Wine and apéritifs help keep things on an even but festive level. 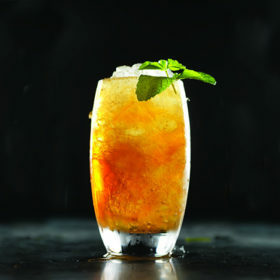 A perfect example of a one such “playful” cocktail is B&W’s bubbly Brunchapuncha, made with a French press. Lower-octane libations are also versatile and food-friendly. So go ahead and make that over-the-top egg strata recipe. We can’t guarantee that these gorgeous drinks won’t steal the spotlight, but they won’t deter guests from taking a second lap at the buffet. Ideal for those who can’t decide between coffee or a cocktail, this deliciously bittersweet Negroni variation substitutes cold-brew coffee for gin. Schaffner, bar manager for Butterjoint and the soon-to-open Pie for Breakfast, prefers to make cold brew with locally roasted beans from Commonplace Coffee. Bottled cold brew can be substituted. In mixing glass, combine all ingredients (except garnish) with ice. Stir to chill, then strain into rocks glass, over ice if you like. Garnish with orange twist. Serves 1. To serve a group, this drink can be premixed (without ice) and stored in a tightly capped bottle. One cup of each ingredient should serve 8 people. When ready to serve, pour into individual glasses over ice, then garnish each glass.